Small freshwater crustacean, peaceful and quiet. There are many varieties selected in captivity (of which the most famous is the so-called "Red Cherry", with its vibrant red color), which is not recommended for breeding together to prevent hybridization and subsequent loss of color. It can be breed even in very small tanks. It requires clean, fresh water, with lots of plants and hiding places. It can not stand long high concentrations of nitrates. 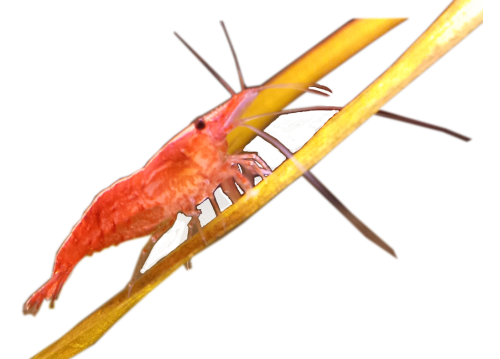 It feeds mainly on algae and, if there is brought together, waste food fish, but at least once or twice a week, diet must be supplemented with appropriate feed for shrimps and/or small amounts of blanched zucchini. It should not be kept with much larger or aggressive tankmates. Reproduction is very simple: the female releases up to a hundred tiny shrimp (about two to three millimeters in length) perfectly self-sufficient, which feed the same things they eat as adults. Caution is advised about breeding it with other Neocaridina species as they may be unpleasant hybridization.